Novitiate Notes: Notes on the Memorial of St. Augustine of Canterbury. Notes on the Memorial of St. Augustine of Canterbury. Today the Church remembers Augustine of Canterbury, the Italian monk sent by Pope Gregory the Great in the late sixth century to evangelize the people of England. A reluctant missionary, Augustine so feared the daunting task ahead of him that during the long journey from Rome to Canterbury he turned around, went back to the Pope and asked to be relieved of his mission. To Augustine's chagrin, Pope Gregory refused his request. Ordered to persevere in his mission, Augustine ultimately enjoyed such great success that he became known as the "Apostle of England." Augustine's episcopal career was relatively short - he spent only about eight years as a bishop - but in the brief time given him he baptized thousands and established several new dioceses. Augustine faced the extremely challenging task of establishing unity between Anglo-Saxon converts and Britons who had been Christians since Roman times. Given the feelings of self-doubt that Augustine wrestled with on his way to England, I can't help but wonder whether he struggled with similar qualms as he dealt with the challenges of being a bishop. 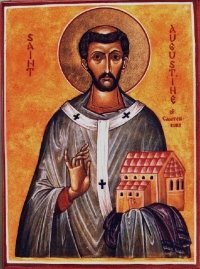 A saint who accomplished great things in spite of personal doubts about his own abilities, Augustine of Canterbury deserves our attention and admiration. I'm sure I could write a lot more about Augustine of Canterbury - I find his story intriguing on a number of levels - but I'm not going to. Why not? Partly because today happens to be my birthday and I have celebrating to do. Another reason I'm going to hold off is that my parents are in town for the weekend and I want to spend time with them. In the absence of posting further reflections on the person of Augustine of Canterbury - if you want to read more, see what English Dominican novice Lawrence Lew has to say on his blog - I'm simply going to say a prayer for his protection as I mark the 26th anniversary of my birth. AMDG. Happy birthday!And thanks for these great posts...I do not comment each time, but I have enjoyed all of them since I found your blog. If it's not too late: Happy Birthday from one novice to another! Thanks, Cole - glad to know this blog has been helpful, even in its dormancy. Prayers for your discernment! Born and raised in Southeastern Massachusetts, I earned degrees from Georgetown and Notre Dame before entering the Jesuits in 2004. I was ordained to the priesthood in 2015 and currently live and study in Paris. The opinions expressed on this blog are my own and should not be taken to represent the position of the Society of Jesus or any other group or institution with which I am or have been connected. Notes on the Memorial of Our Lady of the Way. A. O. Scott on "The Da Vinci Code." Refugee MP loses citizenship, resigns seat. An Octave (?) at Colombiere. Last Titanic survivor to remember sinking dies. Time takes its cost, I'm still the same.